The Oregon Ducks are headed back to the Final Four. 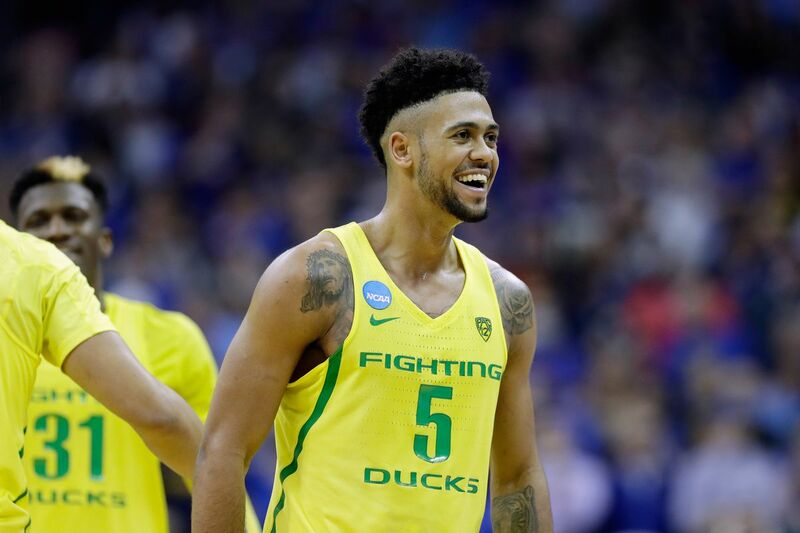 It’s been over 9,000 years (give or take) since the Eugene-based program could say that, but this squad is ready to represent the Pacific Northwest in Arizona and it’s largely because of Mr. March himself, Tyler Dorsey. In four NCAA Tournament games, the Oregon sophomore has scored 24, 27, 20 and 27 points against Iona, Rhode Island, Michigan and Kansas, respectively. He’s shot the lights out hitting a combined 17-of-26 from the three-point line, and he’s knocked down big shots in even bigger moments. But does any of that make him the Final Four’s most exciting player to watch? According to Bleacher Report’s Brian Pedersen, the answer is a resounding yes. Pedersen, who ranked the weekend’s top 10 players based on “talent, statistical production and importance to their team” has Dorsey ranked No. 1. Dorsey’s shooting efficiency is going to play a key role against North Carolina. If the guard is hot, the Tar Heels will be in trouble. If he loses his touch (or more realistically, UNC doubles down on its plan to make his life uncomfortable), the Ducks will need other players to step up like never before. Speaking of other players, Dorsey isn’t alone on Pedersen’s list. Not only do the Ducks have three representatives in the Final Four’s top 10 players to watch, all three make up 50 percent of the top six. According to Pedersen, Jordan Bell (who has been an absolute problem for opponents—especially those named Kansas) lands in the No. 5 spot. Dillon Brooks, the 6’7” forward, is right behind him at No. 6. Oregon will need an offensive attack by committee if it’s going to beat the Tar Heels this weekend, and getting another dynamic defensive performance out of Bell will only help. But if one thing is clear, it’s that Dorsey has earned the right to be named the Final Four’s No. 1 player to watch. After all: You don’t earn the moniker Mr. March without gaining notoriety in the NCAA Tournament. Thank You Bryant. The reason for the big games is he was given the ball up top. Normally he’s in the corners as a spot up shooter. He was recruited to do so. He almost average a triple double in high school. You would have seen the same results during regular season had this happened. Quick exit in the NCAA If this change wasn’t made. We can get away with it against weaker teams. To Kneel Or Not To Kneel – Where Does Oregon And The Pacific Northwest Stand? Oregon Sports News feeds the conversation with entertaining and opinionated content surrounding the top Oregon sports news.